Although a practicing Catholic for (mostly) my entire life, I’d always shirked the Stations of the Cross devotion for one simple reason: I couldn’t bear to attend a retelling of Christ’s final days with visual reminders of his battered and bloodied walk to his death. Merely thinking about Jesus’ crucifixion shook me to the point of physical reaction—clenched jaw, increased heart rate, and all. As a Catholic, I understood the salvation that the Cross represented, but I also dodged earnest contemplation of the crucified man on that Cross. My excuses for avoiding the Stations prayer service toggled between insisting that the timing was inconvenient (Friday evenings?!) to rationalizing that I was already going to Mass on Sundays and, therefore, already getting a passing grade as a Catholic. Then, one evening this Lent, my lifelong avoidance of this devotion came to an end. My daughter, an altar server, had been scheduled to serve at her first Stations of the Cross service. A Catholic school student, she had studied a children’s version of the Stations in class. This gentler version focused less on the agony of Jesus’ Passion, and more on the lessons of compassion and charity derived from it. And just like that, it was settled; we were going. Great, I thought, unease washing over me. Is it bad form to switch pews now? I looked around and decided that it was. So instead, I sat tight and started imagining what was to come. I wondered if this devotion would be attended by fervent worshippers who would pray loudly and engage in animated hand gestures like the ones I’d grown up seeing in the Portuguese and Spanish Masses of my youth. Or was it possible that people were going to crawl around on their knees like I’d seen during the Paschal season in other countries? A man passing out booklets about the Stations handed me one. Relieved to have some pre-service instruction, I began reading. Tradition holds that the Virgin Mary visited daily the site of her son’s suffering, crucifixion, and resurrection on the path that would become known as the Via Dolorosa, or the Way of Sorrows. And as early as the fourth century, Christian pilgrims trekked to Jerusalem to retrace that same path. Stops or “stations” developed along the path, marking specific events of Jesus’ journey to Calvary. I learned that when Turkish occupiers of the Holy Land banned access to these sacred sites in the Middle Ages, the Christian faithful built replicas in their own countries. 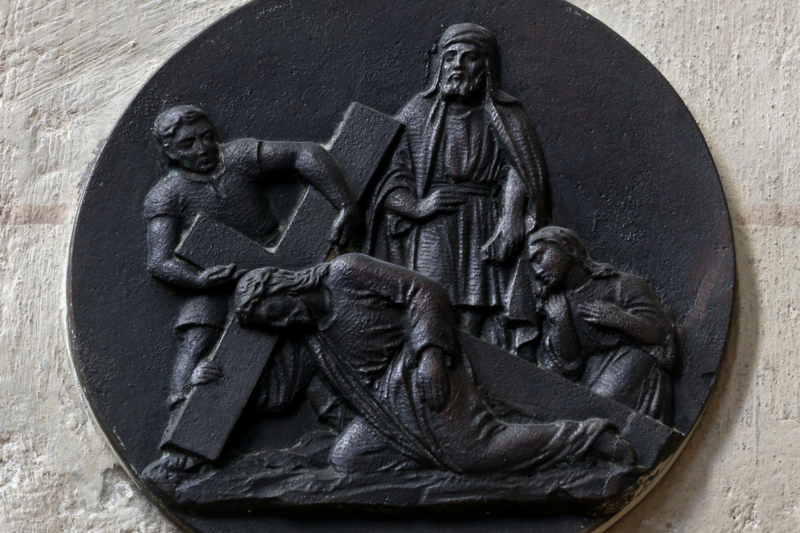 Among the most popular of these replicas were the “Stations of the Cross” of the Via Dolorosa. I closed the booklet. My thoughts raced to the realization that in the years of putting my comfort above my gratitude for Jesus’ sacrifice, I had neglected to spiritually join him on his way to the Cross. I fought back tears as it dawned on me that I had also neglected to accompany Mary, whose anguish I cannot fathom as she watched her only son stumble in agony toward the site of his crucifixion, made to carry his torture device on his shoulders. I watched my daughter walk out of the altar server room, accompanying the deacon as the Cross-bearer for the service. The service began. The deacon went from station to station, announcing the Passion event depicted and saying a prayer to which we, the congregation, responded. Praying that first Stations of the Cross was unnerving at times, gut-wrenching at others. It was also inspiring and fortifying. I felt a unity with the other parishioners as we worshipped, knelt, and stood as one people accompanying Jesus toward his crucifixion and, ultimately, his triumph over death. That spiritual walk along the Via Dolorosa also strengthened my resolve to display empathy over enmity in my earthly walk with others. And to my delight, that Stations service deepened my relationship with the Blessed Mother by prompting me to return to praying the Rosary, which had often centered me in the past during times when I had spread myself too thin. My daughter, for her part, was moved by the devotional service, too. Adding to what she already knew of the Stations of the Cross in the more child-friendly version she had studied in class, she was awed by how much the service we attended engaged the senses, with the smell of incense filling the nave and the sight of the beautiful monstrance exhibiting the Holy Eucharist at the end of service. As my daughter and I walked out of church, I knew I’d be back to pray the Stations of the Cross many more times. Once almost fearful of this devotion, I was now eager to attend it again and keep growing in my faith by offering Jesus my solidarity for all he did for us on his walk toward Calvary. 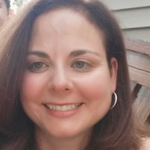 Dolores Smyth is a freelance writer who draws inspiration for her writing from everyday life. A perfect day for her includes running, reading, spending time with her husband and three children, and enjoying a black and white cookie (or two).